Powerful Syrian rebel chief Zahran Alloush was killed in a regime air strike east of Damascus Friday, dealing blows to both the nearly five-year uprising and a fragile peace process. Alloush, 44, was the commander of the Jaish al-Islam (Army of Islam) movement, the predominant opposition faction in the Eastern Ghouta rebel bastion east of Damascus. He and five other commanders were killed “in an air strike that targeted one of their meetings in Eastern Ghouta” today, the Syrian Observatory for Human Rights said. A senior member of Jaish al-Islam confirmed Alloush’s death to AFP, saying three planes targeted a “secret meeting” of commanders. The Syrian government and its media regularly refers to Jaish al-Islam as “terrorists,” and state television did so again in the news alert announcing Alloush’s death. A Syrian security source told AFP “dozens” of rebel fighters were killed in the raids, carried out by Syria’s air force with newly-provided Russian missiles. The jets launched two rounds of strikes on the meeting with four missiles each, the source said. At least 12 Jaish al-Islam members and seven from the Islamist Ahrar al-Sham group were killed. Jaish al-Islam is the most prominent rebel faction in the Eastern Ghouta region, an opposition bastion east of the capital frequently bombarded by regime forces. Backed by Riyadh, it recently took part in landmark opposition talks in Saudi Arabia. It was known to have extremist views and to have supported the establishment of an Islamic state before recently moving towards a more moderate position. 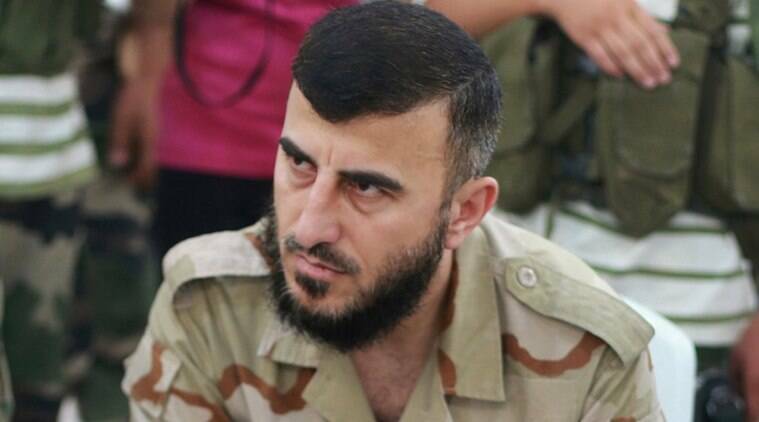 Zahran Alloush was born in 1971 in Douma, one of the largest towns in Eastern Ghouta. His father was a prominent Salafist preacher who now resides in Riyadh. Following in his father’s footsteps, Alloush pursued religious studies in both Syria and Saudi Arabia. Alloush was arrested in 2009 and was released in June 2011 in a general amnesty, just three months after Syria’s uprising against President Bashar al-Assad erupted. He took up arms, and in 2013 united a number of rebel groups under the banner of Jaish al-Islam. With close-cropped hair and a dark beard, Alloush was typically dressed in military-style fatigues.